← What is your Autism Quotient? He wrote a note for his teacher requesting early dismissal. Note for you, Mrs. Russell. Need my parents to pick me at 1155 ’cause I’m goin’ to Woodland Park Zoo. 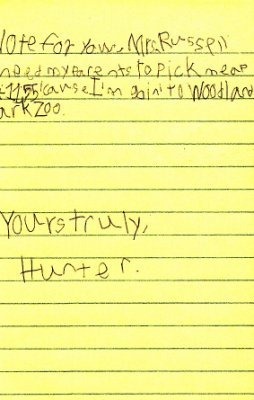 I’m guessing Hunter isn’t enjoying school quite as much as we’d hope. At least he didn’t sign it: "Hunter’s Dad".